When Suzanne Collins set out to write a sequel to the New York Times Bestseller The Hunger Games, she had a seemingly impossible task on her hands. Because, in my opinion, there was no topping The Hunger Games. But oh how Ms. Collins proved me wrong. So. Very. Wrong! Catching Fire takes place six months after the Hunger Games, when Katniss and Peeta have returned home to District 12. I don't want to spoil this great read by giving you too much information. But, I will tell you that although Katniss and Peeta have survived the Hunger Games, their defiance against the harsh rules will not go un-noticed by the Capitol. Even though it seems impossible for the pair to be in greater danger than when they were in the Hunger Games themselves, Katniss and Peeta soon find that life outside the arena might be as bad, if not worse. The pages of Catching Fire are fueled by the promise of uprising in the districts, rebellion against the Capitol, and kissing. Lots and lots of kissing. I'll admit it, even though it's kind of embarrassing, but I read just about every book just for the kissing. Fortunately for me, Ms. Collins doesn't let me down in Catching Fire. In fact, she succeeded in adding more kissing in Catching Fire than in its predecessor, by way of possibly the sweetest love triangle I've read, yet. And because both Gale and Peeta are perfect, in their own way, for Katniss, it's almost impossible to choose which team I want to side with. Currently, I'm siding with Team Peeta (it may change, but I doubt it. He's so dreamy!). So, if you haven't read The Hunger Games, well first, shame on you. Go get it now! And, once you finish you must immediately start reading Catching Fire. I promise you won't be disappointed. 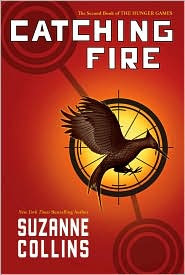 The third book in The Hunger Games trilogy will be released on August 24, 2010. So, until that time comes, I'll be off in Peeta land, dreaming of the perfect, happy ending I hope for (*hint, hint* Suzanne, you have to make Katniss choose Peeta, and give them their happy ending. If you don't, well I'll still love the book, but after I finish, I might die of heartbreak! I'll die, I tell you. Now, you don't want that, do you? So, pretty please with cherries and chocolate on top will you let Katniss and Peeta live together happily ever after? PPPLLLEEEAAASSSSEEE! ) but is not promised to me in any way, shape, or form. A girl can dream though, can't she? I hope you all enjoy! And be sure to pick up your copy of The Hunger Games and Catching Fire TODAY!!! OMG< I just finished The Hunger Games at 2 AM this morning. I couldn't put it down. So good! I can't wait to read Catching Fire. And how cool is that trailer? Thanks for sharing it! How do you read all of these books? I'm in awe of your reading ability, honestly. And such good reviews. I may have to start personally blaming you for the number of books I have stacking up to read! Thanks for another fun review!!! Kristan - I agree, the names...weird. But, after a little while you get used to them, if you can believe that? LOL. I promise you will love them! PS - It's funny that you think Katniss sounds like Catnip, because that's Gale's nickname for her. LOL. I hope you enjoy reading!!! Chelle - I practically live in the YA section at B&N, and I was still reluctant to read this series. I'm just so thankful that Daisy Whitney urged me to read this series! It is a wonderful and completely original series. I hope you venture out and read them! Carolina - OMG...wasn't The Hunger Games sooo good??? Catching Fire is even better, if you can believe it. And the third one, well let's just say August can't come soon enough! It's going to be GREAT, I can feel it! Enjoy reading Catching Fire! I hope you love it as much as I did. Kristi - LOL. Thanks! You should see my pile to read. I have some listed on my blog, but there is probably 10 to 15 more in my pile to read. And, I just keep buying more. I can't help myself. I'm addicted!!! I'm glad you liked the review, and I hope you read the series. It's the best! I love, love, love Hunger Games and Catching Fire! It's been a few months I'd actually like to read them again. (And it is SUCH a great love triangle. So good in fact that I don't even know who to root for). I can't wait for HG3! I haven't read these books because I have five others in line ahead of them. Maybe I should bump them up! Eva - Yes! You definitely need to bump them up! I promise you won't be disappointed! Yes! I love the Hunger Games and Catching Fire! Seriously, they are both in my top ten fav books of all time. It's so funny that you should post this today! I just wrote up a post on my blog discussing why I love Peeta so much, and why I'm sure Katniss will pick him in the end! 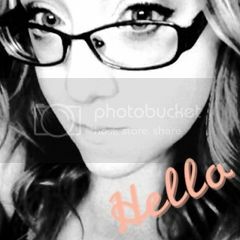 Check it out, if you'd like! Hunger Games and Catching Fire are two of favorite books I've read this year...wait, last year. I get the team Peeta thing..but for some reason.....I have an attachment to Gale. I don't know what it is. I feel like trash for both of them at this point. I MUST read this book! I absolutely loved The Hunger Games and can't wait to get lost in Katniss' world all over again. Kat - You know what they say: Great minds think alike! I'm so happy to find other HG lovers. I will definitely check out your post! Kristin - Poor Katniss! She has such a hard decision ahead of her. I can't wait to see who she picks. Lisa and Laura - Yes! Read it now! I'm counting down the days until HG3 hits the shelves!